I looove the drop shadow effect (I know it's not the focus of the image but I thought I'd point that out). These pictures look wonderful together. I've always loved black and white images. Seem to make things look older and proffessional. Great work. Gorgeous Jean! Really classy. Congrats on the high finish. Quality, this could be on a wall. I'm a lover of simplicity in photographs - to me they can be the most powerful images . This is a fine example of that. Congratulations on your high finish. Should have been a ribbon ! Quality work Jean, simple, stylish and elegant. One of a few submissions that benefits from the triptych form by creating tension between the panels. One of my favorites in this challenge. Congratulations on a nice finish. Congrats on top 5. I'd hoped this would ribbon, such a refreshing change of pace. congrats on the top 10, very nice image! I can't believe this didn't ribbon. Still my favorite in the challenge. Dreamlike. Congratulations on your top 5 finish. Gorgeous work. Beautiful photo. Triptych works nicely here. Good contrast. And the seperate "floating" panels is a nice touch. I don't like the drop shadow too much. But it doesn't detract too much. Great photograph. Probably looks just as good undivided. I really like the composition, and the b and w, and the shadowing around each frame. wonderful shot. The shadowing is quite creative and nice too. I like it and the shadow effects. A finely-balanced image with a great deal of emotive content, one of my high scorers. I'm not quite comfortable with the balance of the white space here, but I am trying to view them as I suspect you intended me too, as 4 panels floating borderless and unframed on a white wall. Bumping on review. Good luck! I'm not a member so I can't vote, but I would give this a 10. I love it! The sky, the silhouette, the reflection--everything about it is captivating. Best of luck. Can't wait to see this ribbon! the photograph you used here is lovely, but I don't think the triptych format enhances it. the drop shadows are distracting. That's one of the cases where the single picture fits well the tryptich. I personally don't like the drop shadows, but the picture is very nice. beautiful photo(s), but why the shadowy borders? This is awesome. My idea of a triptych using the middle panel to tie the outside ones together. Awesome picture. I think it would look better w/o the division into three panels, but it would take more than that to screw this shot up. Good luck. It seems entirely arbitrary that this has been cropped into three frames - sure, that was the challenge and all, but does that framing ad anything to this scene? I cannot see it, if so. It would, I think, have been a pretty if fairly orthodox shot without that split. I was, and am, hoping for some genuinely adventurous use of the idea of presenting three frames together - some sense of progression, of the importance of the different scenes, rather than arbitrary division. It is just amazing what a difference an effective boarder can make in these triptychs. Without the addition of the shadow, i feel the image would have been lost in the white. 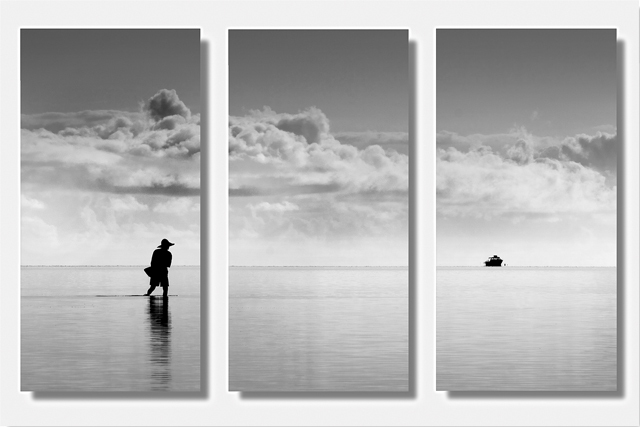 The reasons i like this triptych is that the man is in ilhouette, with a ripple from the water at his feet that pulls your attention into the section frame. The distant silhouette of the boat then pulls your eyes into that final frame. I would have liked to have seen the sky/clouds a little darker on that third frame to match the intensity of the clouds withthe first. i love this shot!!! sooo very pretty!!! 20 if i could, but 10 instead! This is pretty neat, I have to say. I'm not sure about the shadows though, I'm thinking they are a touch distracting and maybe break it up a little too much. Beautiful photo. I love how the figure and the boat are so dark compared to the rest of the photo. This is a great example of a photo that actually benefits from being divided into three panes. In the one pane we have the figure (what a great pose! ), in another pane we have the boat in the distance, and the third pane is empty and separates them, enhancing the sense of wide open space. The tonality is gorgeous, without any blown highlights. My only nitpick is the "drop shadow" type of panels. I personally would have preferred plain panels, since this photo is so beautiful and is not in need of any additional enhancement. But that's just personal taste. Again, great photo. I'm jealous, cuz I like it better than my own entry :) Good luck in the challenge. 9. Peaceful. Very soft and perfect for this challenge. I love the 3-D frames. 7 - Very nice, and simple, works well. Criticism; not sure, just seems it needs a little 'lift' somewhere, not sure how or where, be it colors/toning, outer frame, don't know. Of course, it may just be the small size/restrictions, which I have taken into consideration. The shadow bordering really adds to the overall image, nicely done. The juxtaposition of action to destination is classic. Great shot. Ask a pilot....those clouds are anything but paradise! Nice job! I really like this one. I'm not a huge fan of the drop shadow, but other than tha, great shot! Yes. Someone who understands what a triptych is really about. How would this have been in color? I love this. No clutter. Very beautiful. A little too much shadow / depth in an otherwise fantastic set. Well this is a sure ribbon if I've ever seen one. Congrats. 10 and favorite. Of all the single-image-divided-in-three-parts entries I've seen so far, this is the best. The proportions lend themselves really well to it. Beautiful, and evocative. Stunning. I love the silhouette against the pale ocean and sky. The shadows of the three images also looks really lovely here. I've rarely seen an ocean look this glassy and smooth. Wonderful idea for this challenge. 10. Proudly hosted by Sargasso Networks. Current Server Time: 04/20/2019 10:56:01 PM EDT.